Due to a planned construction project inside the cave during the off-season, Jewel Cave is not taking advanced reservations for Scenic Tours from October 2018 through about April 2019. We apologize for the inconvenience and look forward to assisting with your vacation plans in the future. If you have questions about other programs and visitor services at Jewel Cave, please contact the Monument directly at (605) 673-8300 and speak with a park ranger. NOTE Please be advised that during the off-season, the visitor center, park store, and surface trails at Jewel Cave are still open on a daily basis from 8:30 a.m. to 4:30 p.m. 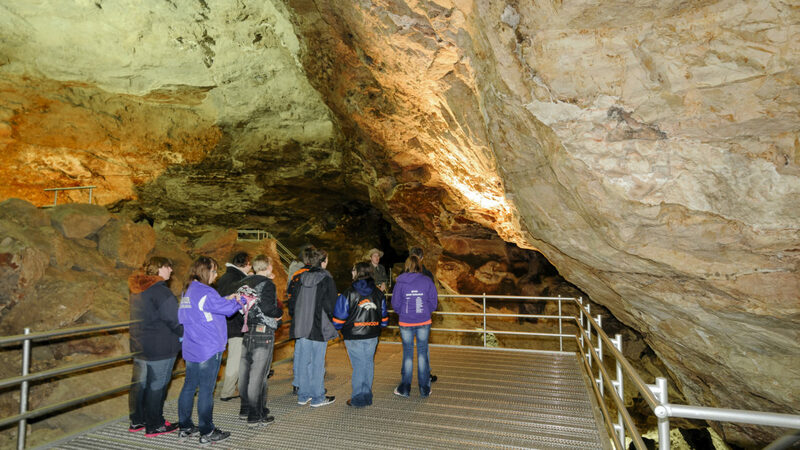 Same day tours for the Scenic Tour are ONLY available on a first come first served basis on-site at Jewel Cave. Advanced reservations can be made between 72 hours and 90 days prior to arrival. Reservations cannot be made inside three days of arrival. To reserve a tour time: If there are no matches for the time & date you search, change your search to check other availability. The TOTAL number of slots available per tour are indicated by clicking on the AGES 17+ drop down box. The number in that box represents the TOTAL number of tours available for that time frame. If the number is 1, there is only 1 tour TOTAL available. Each tour has a maximum capacity of 30 people. Tickets for the Historic Lantern Tour, the Wild Caving Tour, or the Discovery Talk are ONLY available at Jewel Cave on the day of the tour on a first come first served basis. Advanced ticket sales are not made at Jewel Cave. To insure a pleasant experience, PLEASE READ policies below before you visit. Participants must be at the Monument at least 30 minutes prior to their scheduled tour time. Late arrivals or missed tours will not be refunded. Sandals, flip flops, open-toed thongs, and other non-secured footwear are not allowed on any cave tour. Participants with physical limitations or health concerns need to be aware that there are 723 stairs along the Scenic Tour. Guests that depart from the cave tour early will not receive a refund. Hand bags, backpacks, purses, fanny packs, walking sticks, and other carried items are not allowed on cave tours. Guests are required to leave these items in the security of their personal vehicle. Food and drink of any kind are not allowed inside Jewel Cave or other visitor facilities. Jewel Cave is 49 degrees F (9 degrees C) year-round. Guests are encouraged to wear a light jacket or pull-over sweatshirt for comfort. Cameras are allowed inside the cave; however, due to safety concerns, camera use is not allowed on the stairs. Infants are allowed on Scenic Tours using front-carriers only and the child must remain in the carrier throughout the duration of the tour.. Toddlers that walk through Jewel Cave must be able to navigate the stairs and walkways on their own. Parents or family members are not allowed to carry a child of any age through the cave without a front-carrier. NOTE: Strollers are not allowed inside the cave. Pets are not allowed inside Jewel Cave, excluding service animals. For further information on service animals, please contact the Monument at (605) 673-8300 and speak with a park ranger. NOTE: Reservations are NOT ACCEPTED for the Historic Lantern Tour, the Wild Caving Tour, or the Discovery Talk. Tickets for these tours are purchased at Jewel Cave on the day of the tour.